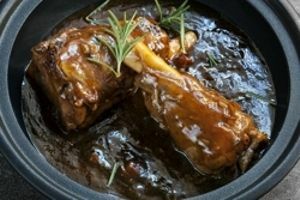 Lamb shank becomes gorgeously tender when slow cooked, and adding the jus adds a wonderful depth of flavour. Serve with minted new potatoes and buttery broccoli for a great family meal. This recipe was designed exclusively for us by John Walter, Head Chef and Manager of The Lakeside Restaurant at the University of Surrey. What better way to celebrate start of spring than with new season lamb? The slow cooking makes the lamb shank beautifully tender and the port and redcurrant jus adds a lovely fruity richness to the dish. Chop the celery, onions and carrots into large chunks and lay in a flameproof casserole or roasting tin. Nestle the seasoned shanks of lamb on top of the vegetables then add herbs, spices, peppercorns, wine and port. Cover loosely with ovenproof foil and bake for 1.5 hours. Remove the foil then cook for another 30 minutes. Meanwhile, boil potatoes with a sprig of fresh mint until tender. Keep warm. Place broccoli in a pan with two cups of water and a knob of butter, season and cover with a tight-fitting lid. Cook over a medium/high heat for five minutes until the broccoli is tender. Drain the broccoli cooking water into the tin containing the lamb roasting juices, then place the tin over a medium heat on the hob to release the caramelised juices before stirring in the redcurrant jelly and more wine as needed; simmer to create a rich jus. Arrange the broccoli and potatoes around the lamb, pour the jus into a warmed jug and serve. Read more about The Lakeside Restaurant at the University of Surrey.